We are having a BIG cold snap here today, so it’s perfect weather for soup. I made this for dinner tonight. This recipe is from a now-closed restaurant called the Inn at Brushy Creek that used to be in Round Rock, just north of where I live. This soup was always the first course, served in small bowls. It’s so hearty, though, that we just serve it in big bowls and make a meal out of it. It is SO easy to make, your house smells terrific while it’s cooking and it’s VERY kid-friendly (it’s got ketchup in it!). I’m going to go here and pick up a nice loaf of something yummy to go with it. Their Spinach Feta bread is delicious, but it does have high fructose corn syrup it it (their Honey Whole Wheat does not). Saute onions and garlic in oil. When they are just transparent, add sausage slices and brown lightly. Add beef stock and all other ingredients. 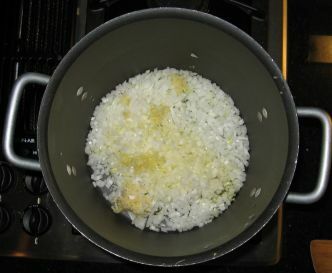 Bring to a boil, stirring often to keep the bottom of the pan from burning. 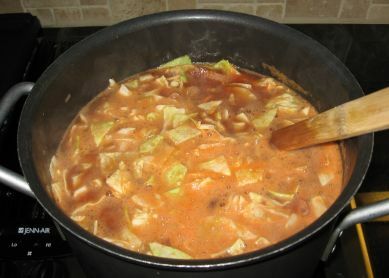 Reduce heat, simmer 35 – 45 minutes or longer, stirring occasionally. Correct seasonings to taste. Yields about 1 gallon. Share this with your neighbors – because of the potatoes, this soup will NOT freeze well, but it will keep in the fridge for a couple of days. 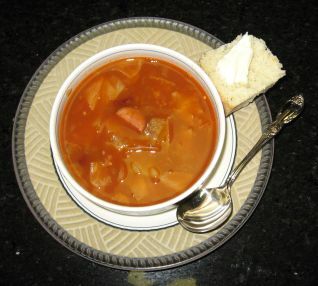 I used to work at the Inn at Brushy Creek as a cook’s helper in 71-72 I actually made this Soup back then. We did several variations of this. We used red and green cabbage mixed for color. We also used Balsamic Vinegar instead of the regular variety. 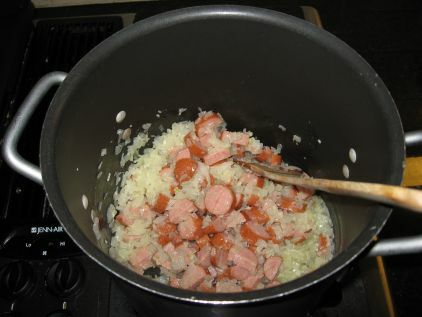 We added the oil first then sausage to get a caramelized effect on the sausage before adding onions and garlic (Onions) sliced long ways in ribbons. We also cut the Cabbage in ribbons which has no difference in taste. We changed it up on occasion and added cut squash yellow at the halfway point in the cooking process…and zucchini a time or two if memory serves. The Inn closed years ago! But it did have serve some of the best food in Central Texas! Loved their Portugse Soup with the brown bread from around Rock Bakery! Lots of great memories made there, especially during the Christmas Holidays! Next Next post: BOOT CAMP!